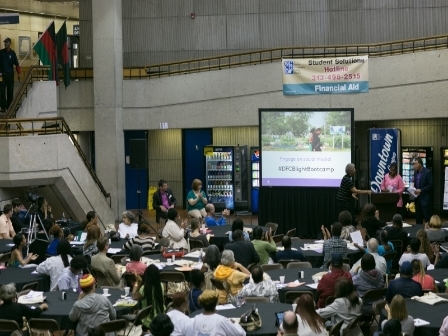 Civic engagement, the open and ongoing two-way dialogue among all stakeholders, is critical to Detroit Future City’s mission – to advance the transformation of Detroit. During the Detroit Future City planning process, Detroiters jointly shaped the development of the DFC Strategic Framework through the involvement of a broad range of participants. Civic engagement has played a significant role in the formation of the DFC Implementation Office’s priorities, projects and initiatives to stabilize and ultimately transform the city of Detroit. As the DFC Implementation Office works to bring the framework to life, participatory implementation is about catalyzing the actions of a broad range of stakeholders across sectors and geographies to work collectively to improve the quality of life for all Detroiters. Since the opening of the DFC Implementation Office in January 2014, we have engaged approximately 1,000 Detroiters in community learning activities to share information and resources, and develop collaborations. Below are details about two of our major community engagement initiatives. 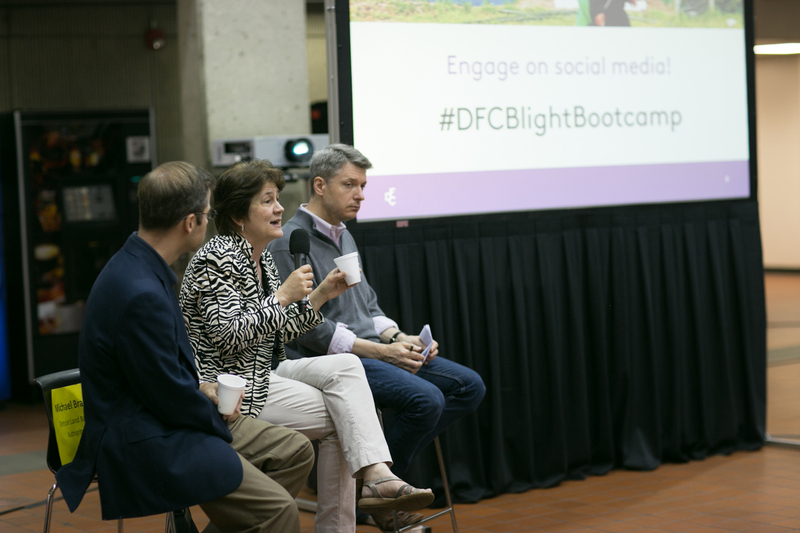 In June, nearly 300 people attended the DFC Blight Bootcamp held at Wayne County Community College District Downtown campus. Blight Bootcamp is a component of the DFC 2014 ‘Spring into Action’ campaign which seeks to create linkages around blight removal activities taking place across the city. The DFC Blight Bootcamp featured 12 workshops with 44 total speakers, outlining various blight elimination efforts and resources, including a copy the recently-released Blight Removal Task Force Report. 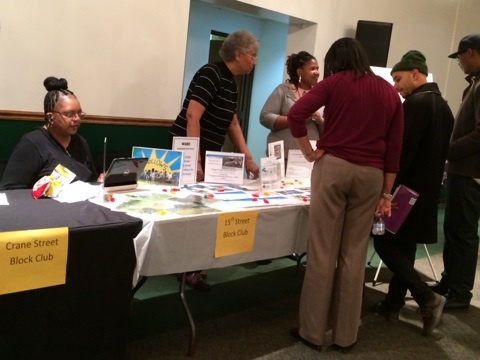 In April and May, the DFC Implementation Office, along with civic partners, held a community meeting in each of the seven Detroit City Council districts. Each meeting included a district-specific presentation of our implementation efforts, remarks from organizations in that district, and allowed for community questions, feedback and resource sharing. More than 500 people attended the meetings and 120 survey cards were collected. The DFC Implementation Office will utilize the community feedback to drive priorities and identify possible projects across the seven city council districts. The DFC Implementation Office continues to collaborate with community stakeholders. This year, we partnered with Denby High School to help integrate the DFC Strategic Framework into their senior class curriculum and capstone projects. The students studied the Detroit Future City Strategic Framework and identified solutions to address issues such as blight and transportation. The result of this work was powerful and transformative. Through our collaboration with Denby High School, the students were able to revitalize the adjacent unused Skinner Playfield as a community gathering space with a sports playfield, community garden and performing arts stage. The DFC Implementation Office is using the information and feedback we gleaned from our community engagement activities to inform and shape future projects and activities. To view the reports and feedback, as well as videos and images from the engagement, click here. Also, be sure to subscribe to our e-newsletter and follow DFC on social media to keep up-to-date on upcoming engagement opportunities. We would also like to highlight the initiatives of our community partners that are working to move the DFC Strategic Framework forward. Arise Detroit! 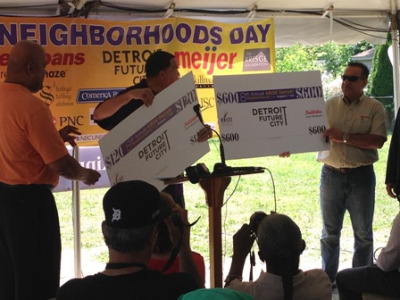 Neighborhoods Day is a citywide event that celebrates the good work y block clubs, churches, schools, community groups and local businesses do throughout the year to improve quality of life for Detroiters. MotorCity Mapping is a comprehensive effort to digitize Detroit’s property information and create clear communication channels back and forth between the public, the government, and city service providers. For daily updates on Detroit Future City and news regarding DFC's priorities like us on Facebook and follow us on Twitter. 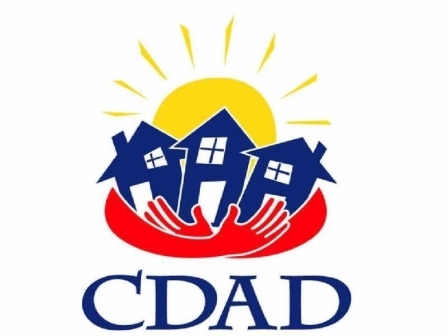 CDAD is an organization that advocates for public policies and resources that advance the work of nonprofit, community-based organizations in Detroit neighborhoods. 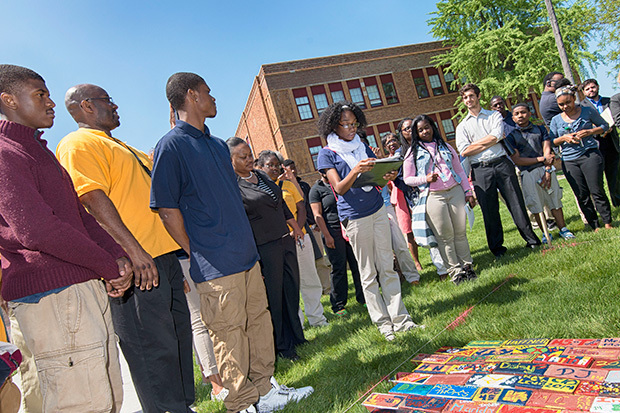 CDAD members are engaged in physical development, land use planning, community organizing and other activities designed to stabilize and revitalize the quality of life in Detroit. For details on membership and how to get involved with CDAD click here. These projects help implement the recommendations outlined in the Strategic Framework. Take a look at the DFC website for update on projects. You are receiving this because you subscribed from our website.